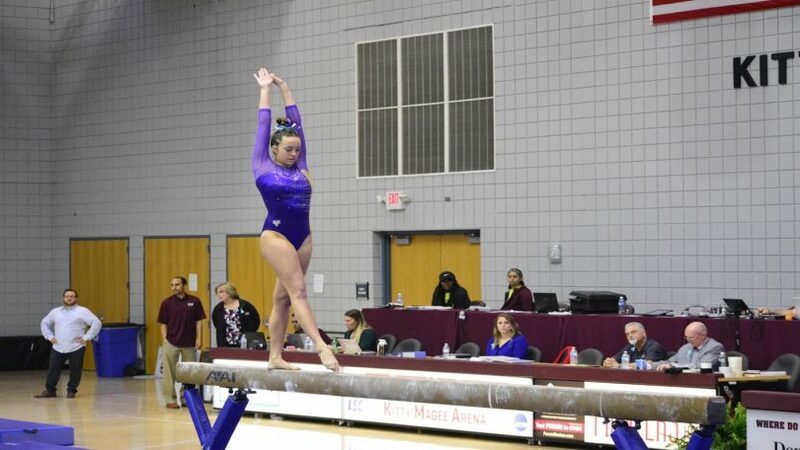 The West Chester University Golden Ram gymnastics team started their season on Jan. 13 at the University of Maryland. They were against University of Maryland, the University of Pennsylvania and SUNY Cortland. The Golden Rams finished strong in second place at the meet. University of Maryland placed first with a 193.85, West Chester University placed second with a 190.65, the University of Pennsylvania placed third with a 190.55 and SUNY Cortland finished fourth with a 183.45. This was a big win for the division two Golden Rams, who defeated the division one UPenn Quakers. To go into depth of each event, the Golden Rams started on the beam very strongly with a 48.2. Sophomore Yoli Nodarse led the team with a 9.775 placing second. Junior Sarah Boyd tied for fourth place scoring a 9.725. First-year Ashley Duke scored a 9.65 for a top 10 finish at the quad meet. Third-year Jordan Miranda also had a very strong beam routine scoring a 9.55 along with sophomore Melanie Wojewoda scoring a strong 9.50 to lead off the Golden Rams. Moving onto the floor, the Golden Rams kept their momentum up scoring a 48.15. First-year Rose Fanara led WCU placing sixth at the meet with a 9.675. Second-year Jessica Meakim and freshman Brashlyn Johnson tied for ninth at the meet with a 9.650. Third-year Miranda also had a very strong routine scoring a 9.60 while fourth-year Lindsay Mathis scored a 9.575. Moving onto the vault, the Golden Rams headed into their weaker event scoring a 47.05. First-year Brashlyn Johnson led WCU on vault scoring a 9.55, and first-year Ashley Duke was next with a 9.475. Finishing up on the bars, the Golden Rams closed the meet with a 47.25. Second-year Melanie Wojewoda and Duke led the rams on the bars scoring a 9.6 tying for seventh place. Fourth-year Myranda Marshall also put up a strong 9.55. Third-year Natalie Onderko also put up a strong 9.450. On Jan. 20, the Golden Rams took their first home meet against Ursinus. They won, scoring a 188.875 against Ursinus College, who scored a 183.225. Judging was tough at the meet, but the Golden Rams fought hard throughout the entire meet. West Chester started on the vault, and they looked a lot stronger than the week before. Meakim scored a 9.375, placing second on the event. Fourth-year Lindsay Mathis and second-year Kelley Lubking tied for third place, both scoring a 9.325. Moving onto bars, the Golden Rams continued their fight. The Golden Rams swept the event. Duke led WCU scoring a 9.575 placing first. Marshall placed second scoring a 9.475 and Wojewoda placed third scoring a 9.425. The Golden Rams also took the top three finishes on beam, looking super strong. Third-year Sarah Boyd took first place with a 9.675. Second-year Yoli Nodarse took second place with a 9.650, and Cassie Hageman took third place with a 9.575. Miranda also had a very strong routine scoring a 9.500. The West Chester University gymnastics team saved their best event for last at this meet, scoring an impressive 48.250. Meakim took first on the event with a 9.825. First-year Rose Fanara took the second place finish on the floor with a 9.700. Other strong routines from the Golden Rams included Nodarse scoring a 9.675. Brashlyn Johnson scored a very strong 9.575, and Boyd scored a 9.500. The Golden Rams are looking to increase their scores throughout the season. Their main goal is to place in the top eight in their division so that they can qualify as a team to nationals. They have a lot of potential to do this, and there are 10 meets left for them to accomplish their goal. The Golden Rams are back in action Jan. 28 at Springfield College. They are hoping to score much higher than they have the past two weekends — so stay tuned to find out.